Sugar Hill orthodontists hear all sorts of interesting questions from their patients about orthodontics and braces. There are many interesting facts to learn about this aspect of dentistry, but there is also lots of myths and inaccurate information floating around as well. Today, we’ll compare the facts with the fiction to help clear up some of the confusion. Orthodontics and braces are just for kids. False. Approximately 20% of all orthodontic patients are adults. The benefits of braces and other teeth-straightening procedures can improve the oral health of adults in many of the same ways that they benefit children. Many adults who were orthodontic patients as children are opting to try braces again in order to restore their proper tooth alignment. Orthodontists only treat the people with really bad teeth. False. Orthodontists are experts in every aspect of tooth alignment. From minor alignment cases to major surgical conditions, orthodontists have the knowledge and skill to provide you with the best possible dental alignment. Any patient can be an orthodontic candidate, no matter the complexity of their smile. 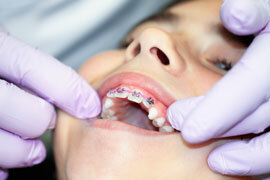 Braces are painful and the procedure takes several years to complete. False. While there is typically a period of adjustment when it comes to braces, it doesn’t take long to get comfortable with the appliances. As your teeth move closer to their ideal positions, the entire process becomes easier and more comfortable. Also, some orthodontic procedures can be completed in just a few months, rather than many years. Braces can connect with the internet and set off airport metal detectors. False. The metals that are used in braces are not magnetic, they are safe for the body, and they will not trigger metal detectors in the airport. And for now, you won’t be able to use your braces to pick up any Wi-Fi signals! Any dentist can give you braces. False. Braces and other orthodontic techniques are safest and most successful when handled by members of the American Association of Orthodontics. An orthodontist is a dentist who has received several years of specialized education after completing dental school. Want more facts about braces? Contact a Sugar Hill orthodontist today. ← Why Do Orthodontists Use Palatal Expanders?